Many of our mid-sized clients struggle with realizing true value from their IT investments, including their investment in the IT Director role. For a good description of the value to expect from IT, please browse our April, 2015 article Is IT Providing Value In Your Business. Part of the reason for this troubling situation is that many executives install the role of the IT Director to merely “manage the IT department” for the enterprise. IT Directors typically manage a group of 5 to 25 people, and these folks may be split into a few teams including infrastructure, applications and the service desk. Fortunately, that is only part of the story – the instrumental IT Director can (and should) do a heck of a lot more. Today, it is an inescapable conclusion that technology is a critical lever for business success. Most business executives know this, but because of the complexities of a constantly changing technology landscape, these same business minds find it easy to delegate critical business decisions to their IT leader. This approach is fraught with danger, as the key responsibility to ensure delivery of business value from IT now rests largely on the shoulders of the IT leader, an employee in most mid-sized organizations who does not traditionally have the right skills to manage IT investments from a business perspective. These IT professionals are usually more interested in the technology-specific responsibilities of their role, and at best they work on providing decent IT services, failing to leverage IT for true business value. As an unfortunate byproduct of their technology-focused training, many of these professionals fail to develop strong communication skills, especially with customers. Successful IT Directors develop an empathetic, helpful customer service attitude in serving their clients and instill these traits throughout the teams they manage. The best IT Directors build excellent personal relationships with their customers in order to learn more about the business, and the challenges others may not see from their unique vantage point. This unique level of exposure allows them to use their technical skills to innovate, designing purposeful solutions that add measurable value to the organization. As technology people advance in their technical careers, there is a strong tendency to do things themselves in order to “get it done right”. When they assume a manager/director role, a strong shift in attitude is needed from doing things yourself to motivating and coaching team members to accomplish these same goals. This is a skill that may not come easily to someone who has been used to doing things themselves for many years. IT Directors need to be effective at leading people by establishing the vision for IT, and also coaching and mentoring their people to give their best. 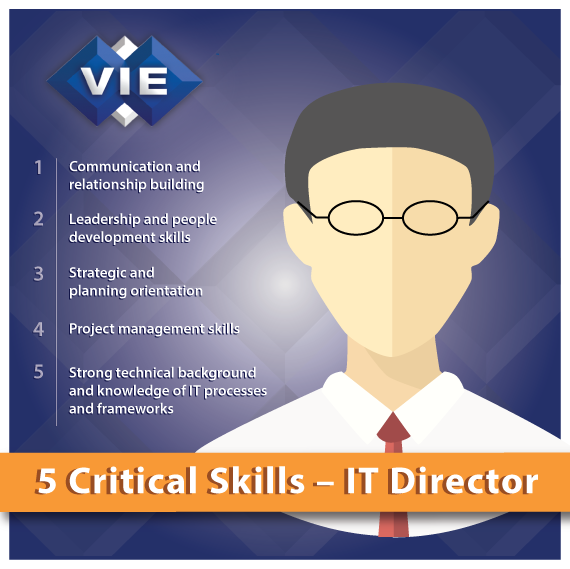 A critical aspect of the IT Director role is a strategic and planning capacity. Although they may be involved in the day-to-day delivery of IT services through the activities of the IT team, they also need to maintain focus on the larger strategic impact and value of IT services. They can do this by learning as much as possible about the business objectives and metrics, as well as strategic initiatives, then building an IT strategy that best supports the business. Exposure to planning orientation with executive leadership is critical, as it can be difficult to marshal IT resources in a hurry. By including the IT Director in business planning, enterprises are able to meet the needs of the business proactively in the most efficient way possible. A McKinsey & Co. study done in 2012 of 5400 large scale IT projects found that 17 percent of those projects go so badly that they threaten the company’s very existence. On average, IT projects ran 45 percent over budget and over time, while delivering 56 percent less value than predicted. Why is this happening? Project management skills are process-oriented skills that are somewhat unnatural to tech people. For certain large projects such as a major infrastructure upgrade, or an ERP system implementation, IT Directors must have the right skills to succeed. Some of these skills include requirements gathering, scoping solutions, estimating costs, figuring out return on investment, selecting resources to work on projects, scheduling and monitoring tasks. Gain more insight into healthy project management practices, here. Finally, IT Directors must have broad knowledge of technical IT skills in order to do their jobs effectively. Examples of these skills include networking, server management, IT security, cloud computing, IT applications, etc. As an IT Director, they don’t need to know the deep-diving specifics of any particular technology, just enough so they can direct the work of their team. In addition, since delivering IT services is now the work of a team, it is critical to establish discipline of standard IT work processes using frameworks such as the IT infrastructure library (ITIL), Software Development Life Cycle (SDLC), Project Management Book of Knowledge, and ISO 27002 for security will be critical in organizing IT work, and delivering cost-effective IT services. In 2013, one of our public sector clients informed us that they were not happy with the performance of their IT Director. A critical project had been delayed several times with no end in sight. After a short discussion of the capabilities of their IT Director along the five key skills mentioned within this article, it was apparent that the director was deficient on many, and lacked motivation to improve on any of them. Our client decided that they really wanted to make a change, but hiring a new IT Director can take up to six months. This was the critical juncture when they decided to contract with VIE to provide an Interim CIO for six months. We installed a seasoned CIO who quickly went to work helping to improve their IT organization. Over five months, the VIE Interim CIO helped re-track the critical project, established a solid IT strategic plan, increased staff morale, and raised the level of service and overall value of the IT team. We also helped the client hire the right long-term IT Director, contributing to the eventual hand-off in duties. Learn more about the CIO services VIE provides, here.